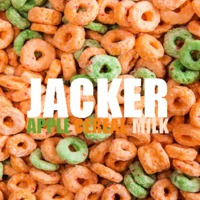 Jacker is: Apple, Cereal, and Milk. This is a take on apple jacks cereal but with less apple and cinnamon to be bit more forgiving on the profile. Very pleasant cereal grain that screams whole grain and kid nostalgia. Enjoy no subs and please leave your review. Cap Apple Snax: Dried Apple and Whole Grain Oat Flour. Cap Cereal 27: Whole Grain Corn Flour. Fa Apple Pie: Ascorbic Acid and Wheat Grain. Fa Stark (Apple): Apple Juice Concentrate.